With dangerous wind chills and heavy snow predicted this week, school superintendents are keeping an eye on the weather map to help them find the sweet spot between closing too soon before a forecast is set, and giving parents enough notice to find child care. For a city district like Niagara Falls, which has about 2,500 students walking to school, wind chill appears to be the biggest factor this week, Superintendent Mark Laurrie said. "We'll probably wait until Tuesday evening to make a decision," Laurrie said. "We don’t want to go too early; things have been known to change." In Niagara Falls, like Buffalo, with high student poverty, some students rely on the schools to get a good breakfast and lunch. "If they don’t get to school that day," Laurrie said, "they don’t get a good meal and a warm place with a lot of attention and something to do." 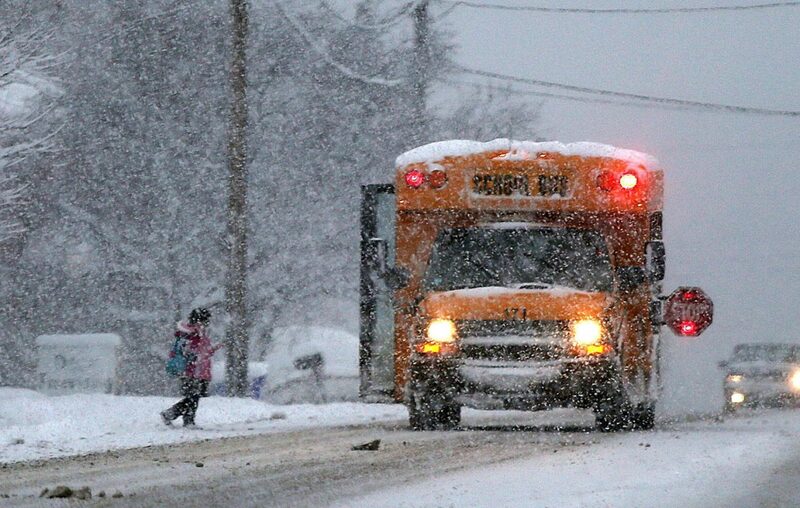 Buffalo School district spokesperson Elena Cala said in an emailed statement that because most students are "walkers" – either to the bus stop or their school – the district is especially mindful of dangerous weather conditions. "The decision of whether or not to close schools is based on New York State Department of Education guidance," she said. "When the National Weather Service issues wind chill advisories between -15 and -25 degrees, the Buffalo Public Schools will strongly consider closing." For Hamburg, the decision this week depends on how cold it gets, and how much snow falls and blows around. Superintendent Michael Cornell praised highway superintendents for clearing the roads of snow in the district, which includes the Boston hills. Most children in the district could spend about 10 minutes at a bus stop or walking to school, so wind chill gets to be an issue when it reaches the 20-below-zero range and colder, he said. "It really all just boils down to if we can get kids to and from school safely," Cornell said. Forecasting in Western New York is tricky, he said, particularly with bands of lake-effect snow. "We try to give as much notice as we can. A lot of people would like us to make the decision the night before," he said. "We make the call as soon as we can, but also as soon as we’re certain." Lancaster tries to make closing decisions by 5:30 a.m. the day of the closing, according to a letter from the superintendent on the district website. Timing for the weather is an issue. Some heavy snowfalls can be cleared early enough to open schools, while a moderate snowfall that that starts at 4 a.m. could present a problem. "Although my staff and I do our best in this process we know that no perfect decision exists," Superintendent Michael J. Vallely wrote. He added that parents can keep children home if they feel it is not safe, and he suggested discouraging teenagers from driving in bad conditions. Barbara O'Brien – Barbara O'Brien joined The Buffalo News in 1984. A native of Rochester, she graduated from St. Bonaventure University and has reported on suburban and education issues.